After months of escalating protests, Gap has finally capitulated—or at least someone wants us to think it has. An email on Tuesday, alleging to be from the American apparel giant, claimed that Gap had decided to sign the Accord on Fire and Building Safety in Bangladesh, a legally enforceable, first-of-its-kind contract that holds brands accountable for safety and labor conditions in the factories they employ in Bangladesh. Despite its convincing tone, the press release, its accompanying website, www.gapdoesmore.com, and the affiliated Twitter account, @gapdoesmore, are completely fraudulent, according to company officials. The website, which bore the motto “Do more than sell clothes,” has since been taken down. Twitter has also suspended @gapdoesmore, although a replacement account, @gapdoesnothing, was still live at press time. 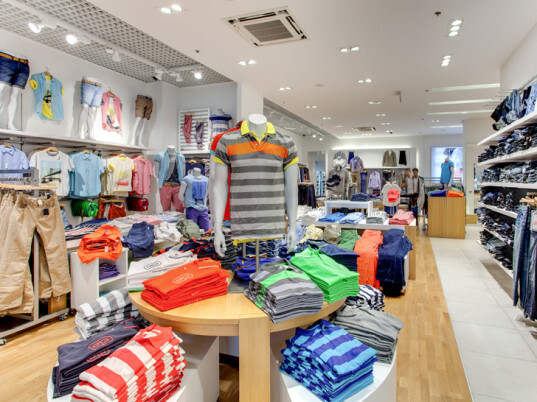 The hoax email said that the retailer, which also operates the Old Navy, Banana Republic, Athleta, Piperlime, and Intermix brands, takes its commitment to improving conditions in Bangladesh “very seriously.” It also claimed that Gap would be compensating the victims and families of the fires at That’s It Sportswear in October 2010 and Aswad Composite Mills in October 2013. 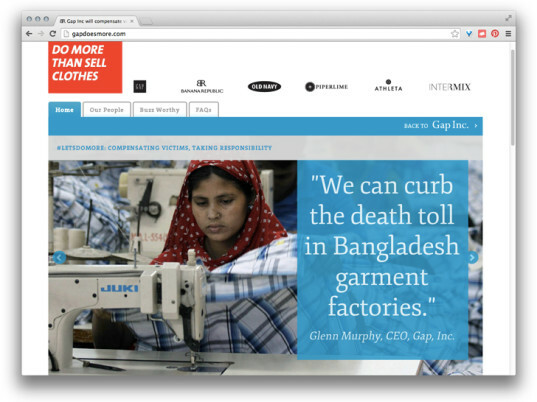 Gap has shunned the Bangladesh Safety Accord—almost infamously so—since its inception. Forged in the aftermath of the Rana Plaza building collapse, which killed over 1,133 people and injured thousands more in April 2013, the agreement has long been a bone of contention between Gap and labor-rights groups. The so-called announcement coincided with Gap’s annual shareholder meeting in San Francisco, where representatives from the International Labor Rights Forum, Jobs with Justice San Francisco, SumOfUs, and United Students Against Sweatshops delivered the Public Eye Award to the company earlier today. Demonstrators urged Gap to not only sign the accord but also compensate the victims and families of disasters at factories it previously worked with. They additionally pressed the retailer to demand a minimum wage of $160 per month from its Cambodian suppliers—while paying the factories enough to support the wage increase—and to insist that the Cambodian government release the 21 activists it has detained since January. 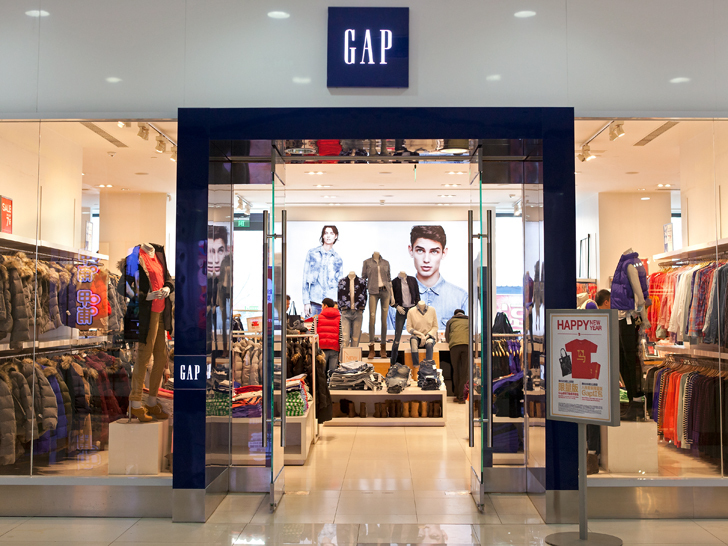 RELATED | Is Gap the Worst Corporation of 2013? An earlier version of this story inaccurately reported Gap’s signing of the accord as fact. We regret our gullibility the error. The gapdoesmore.com website is back online, albeit in truncated form. We’re glad you’re paying attention to the struggle for fair labor practices in Bangladesh! We obviously think this issue is super important, and we’re glad you agree. We know that ethics are something you take seriously, but it’s a little over-the-top to accuse our spoof website of “fraud,” considering we aren’t getting a dime from anyone through this. Frankly, we think that the real fraud here is the Bangladesh Alliance on Worker Safety–since it’s not legally enforceable or involve third party inspections, but does go a long way to making your brand look pretty shiny. We also just wanted to add that we were thrilled to read in Women’s Wear Daily that you’re “exploring your options” about what action you should take. We’d like to encourage you to consider the options thoroughly, and not rule out any of them, including what seems to be the most obvious: compensating families of the dead and survivors of the Aswad Composite Mills fire and signing the Bangladesh Accord. Sometimes the best solution is the simplest one, right? We’re looking forward to hearing what’s next for Gap Inc. Maybe next time you can drop us a line directly instead of passing us notes via our web host?